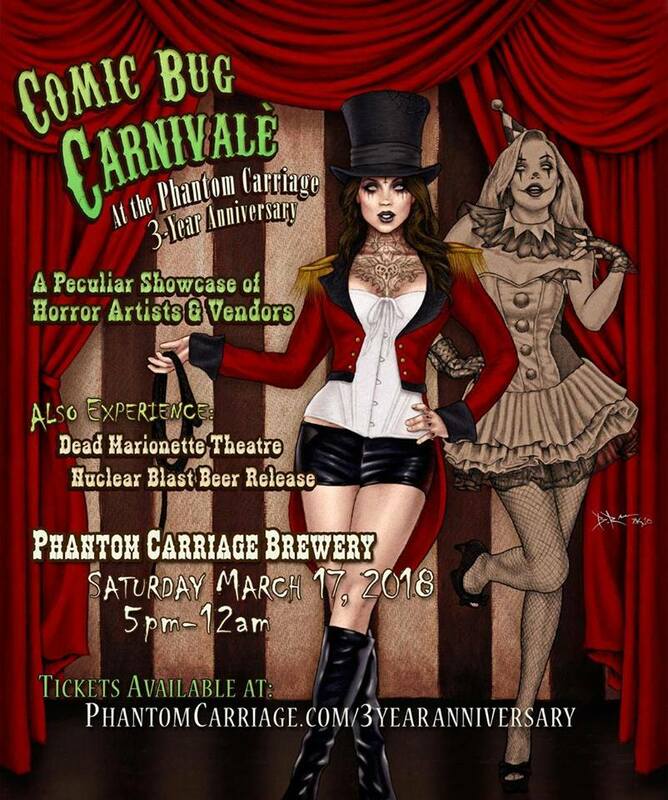 The Comic Bug joins in on the fun at The Phantom Carriage's THIRD ANNIVERSARY PARTY as we bring THE COMIC BUG CARNIVALE to the evening's already awesome festivities! Joining us under the BIG TOP are writer David Blake Lucarelli (Children's Vampire Hunting Brigade, Tinseltown), David Moreno (Vlad, The Sapphire Directive), Denise Carrillo (The Sapphire Directive), Edward Ambriz (Vlad),Ben Russel (horror artist), Rick Escalante (horror artist), Rafael Navarro(Guns A' Blazin, Sonambulo), Mike Wellman (Guns A' Blazin', Gone South),Adam Marcus (Secret Santa, Jason Goes to Hell, Texas Chainsaw 3D),Debra Sullivan (Secret Santa, Jason Goes to Hell, Texas Chainsaw 3D),Ghoulish Bunny Studios (horror artist, Ghoulish Grimoire), Bat in Your Belfry(horror artist), Andysocial Industries (horror artist, Bloodsucka Jones) and a few more to be announced! Come for the suds, stay for the thrills! Here's what else to expect! Featuring 20+ of our own wild beer (including archived rarities) plus rare guest beer offerings from local craft breweries, delicious house-smoked BBQ, wicked music & as always -- macabre horror films. Expect a night filled with drinks and debauchery! We are beyond excited to announce this collaboration as we have been fans of the music that Nuclear Blast puts out for many, many years… and when this opportunity came up we were stoked to partner with them and develop a unique beer that is inspired by Germany's Black Forest but is also approachable with West Coast influences. If you would like to purchase cans but wish not to attend the collaboration release party, cans will be available from our taproom starting at 4pm. After 5pm, event tickets will be required for entry. Dead Marionette Theatre is a fully immersive, 360-degree over-the-top experience, unlike ANYTHING you've ever witnessed! Part rock show, part freak show, DMT is the equivalent of a RAGING party in a haunted house on the eve of the Apocalypse. Steeped with decadently offensive imagery, Dead Marionette Theatre takes aim at anything and everything with the twisted sense of humor of a serial killer. PRE-SALE TICKETS: $15 each (plus $1 transaction fee). Your ticket purchase will give you OUR commemorative anniversary glass, access to the outdoor festival area, DMT show, obscure vendors, rare beer tent, and indoor taproom facilities. Normal taproom hours will take place from 12pm-12am. Our back parking lot will be closed for the entire day/night. At 5pm a ticket will be required for entry, and anyone under the age of 21 will not be permitted to stay.